This jacket from Joe Rocket is made of a lightweight (1.2mm to 1.4mm), genuine cowhide black leather. The brand name is officially licensed directly from Suzuki, so you know this is not an imitation. Configuration options include a removable spine-protector pocket. Included is a plastic body armor pad, but you can upgrade that to a CE-rated protector that meets the highest European Union specifications. The waistband is adjustable and the jacket has a midsection zipper for attaching pants. Other features include a reflective and a air-cooling ventilation system. 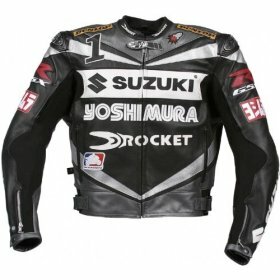 Logos include the Joe Rocket logo, the GSX-R emblem on the sleeve, and the Yoshimura name on the chest. Also available in white and sky blue.